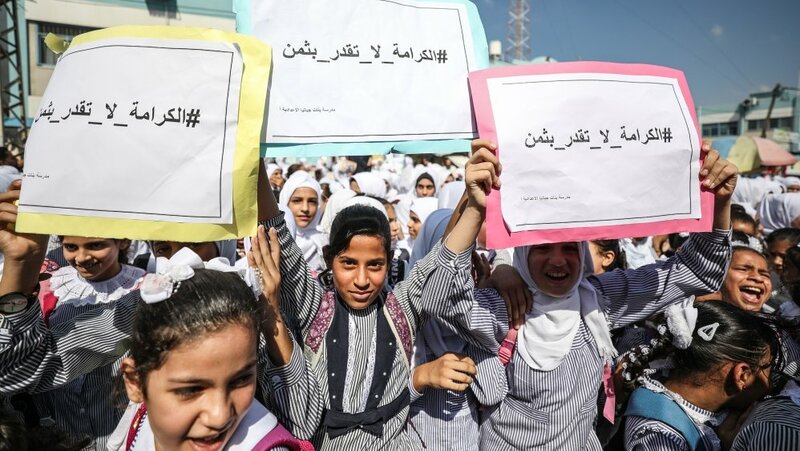 The media office of the Palestinian CP condemned the decision of the "Zionist entity" to close the schools of UNRWA (The United Nations Relief and Works Agency for Palestine Refugees in the Near East) in Jerusalem. The Palestinian CP considered this step as "a serious escalation by the state entity of Israel" against the rights of the Palestinian people. The statement expressed that this decision is an attempt by this state "to write off the right of the Palestinian people to return and to Judaize the city of Jerusalem". The media office of the Palestinian CP called on the people of Palestine in Jerusalem to confront this decision because of "the great danger it poses to the Palestinian presence in occupied Jerusalem as well as to the Palestinian masses in the West Bank and the Gaza Strip and inside the Green Line". The Palestinian CP called the Palestinian people to support their people in the city of Jerusalem in the face of the fascist and racist decisions imposed by the Israeli state.